I realize red meat get a bad rap from a healthy eating point of view but like anything moderation is the key. Beef is such a versatile meat. Personally I tend to like the cheaper cuts which are cooked low and slow for maximum flavor.Here is useful Infographic on the uses for various cuts of beef. I am also sharing a couple of me favorite recipes. Guinness is an incredible compliment to beef in a stew so click over and check out the Guinness Beef Hot Pot Recipe. If you look at the two pics you’ll notice my food styling needs some work or at least less repetition. 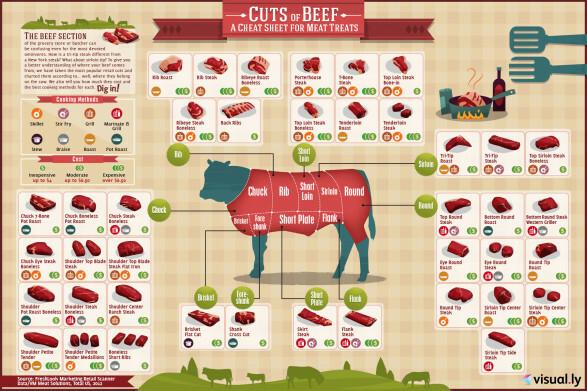 Cuts of Beef infographic by sounas.